I. am. a HUGE fan of Steven Curtis Chapman. When I was growing up, my dad, who was a worship leader in our church, examined every album I ever bought. He would read the lyrics to make sure that they were solid. He didn't care so much about the sound the music made, so much as the lyrics were solid. I found this dedication of his somewhat annoying while secretly being grateful that my dad cared enough about me to care about what I was listening to. At any rate, several musicians didn't make the cut of my dad's approval list. But! Steven Curtis Chapman always made the cut. So I've been a fan of his since For the Sake of the Call . 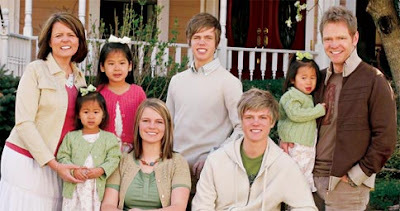 When the Chapman family decided to pursue adoption and started talking about it and promoting it, I thought that was wonderful. When we felt the call to adopt ourselves, I took an even greater notice in what the Chapman's were doing and began to deeply appreciate their willingness to stand front and center in front of the media and discuss it. I've admired their dedication to their daughters and for spreading the message about adoption. Therefore, when I heard that their adopted daughter, Maria, had been killed when her older brother accidentally hit her with his vehicle, I was heartbroken, as were many who knew the Chapman family and have followed SCC's music ministry. What I didn't know at the time was that the pain the Chapman family was walking through with Maria's death was one my own family would walk through with the surprise death of my brother-in-law, Landon, at age 19 earlier this year. What I didn't know when Maria died was that the Chapman's were being walked into a new type of ministry that would aid me in processing the death of my own father from cancer. They visualized death before me and as a result their ministry continues to bless. Celebrating the glory of God in the joy is easy, yes? But it is celebrating in the pain that is excruciating. But when you see someone doing it, doesn't it just lift your heart and build you up? Therefore I was incredibly excited (over exuberant, if the truth must be known!) to discover that Steven Curtis Chapman has just finished recording a new album which is due out November 3, 2009. I wrote down the words to Beauty Will Rise as I was listening to it (and simultaneously bawling my eyes out). ... out of these ashes, beauty will rise." It truly hurts me worse when I hear people talking about the pain of life without discussing the triumph we can know in Christ. That yes, even though the pain cuts so deep that the scars never feel like they can possibly heal over (and even then, that you might not want them to), that God is still in control. To hear this musician standing up and saying, "Blessed be the name of the Lord" in the midst of heartache, soothes my soul. So I was sitting here at my desk this afternoon while Bookworm1 was napping, listening to Beauty Will Rise and weeping and laughing simultaneously. Why was I crying? Because I was thinking of death. Why was I laughing? Because death takes us to life and the grave has been conquered. I was laughing because tragedy is already being turned around and used for glory. Death has already lost the battle. Christ has already won the victory. That is why, folks, the Chapman family can still stand up. It is the only reason my mom gets out of bed every day and the only reason I can joy in a future where my children will not know my earthly father or their uncle who everyone loved. I weep for the pain. I laugh because of the victory. It doesn't necessarily make sense but this is the mercy of God. I don't always understand God (nor do I expect to) but I can say confidently that He will make all things beautiful in His time. 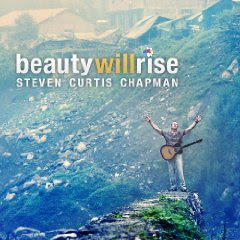 And just as a tiny, tiny piece of proof - He gave Steven Curtis Chapman the ability to write and sing Beauty Will Rise . And it's a truth. Beauty will rise. It is, as SCC sings, "a promise." Thanks Carrie for this post. I too love the music of SCC. I am thrilled to read that he is releasing a new album. I look forward to listening. Beautiful post. And thanks for the reminder about the new album. I'll show my age, but I wore out The Great Adventure my freshman year of college. Saddly up your horses!!! Thanks for this beautiful and heartfelt post, Carrie. I'm crying now as I type. You know I LOVE SCC, too. One of my regrets is that I've never seen him in concert. I'll definitely have to get that new album. May you have a day of peace and the joy of the Lord! We recently saw Steven Curtis Chapman in concert (awesome concert, and both of his sons were there playing). He played a few songs from this upcoming album and they were incredible. Can't wait for it to come out! Love SCC!! Thanks for sharing your heart. SCC came to New England 2 years ago. We planned to go (my first time to see him in concert) but I miscarried the week before the concert and just wasn't up to it. Jesus truly creates beauty from our tragedy and pain. I love your blog Carrie. Thank you for sharing this post - these are some really precious thoughts.